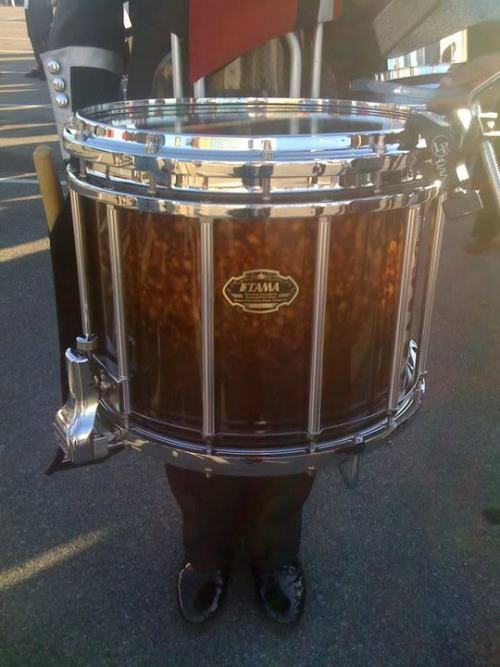 Hello, Tama will be launching their new line of marching percussion at TMEA in San Antonio this February. All info will be released at that time including brochures, photos, specs, etc. Most info I have heard people talk about online is incorrect. I can give you some general info but you will have to wait a few more weeks for the real detailed info. All of the drums, carriers, stands, engineering, design and manufacturing is 100% Tama. The original drums were designed to test some components of the drums and then be destroyed. The Ayala version at Bands of America is closer to the final version although all of the test schools have received the 3rd level of new drums this week. Testing will continue on those drums for a period of months before the final molds are made and production for the general public will begin. All the features I wanted while teaching Blue Devils and other corps are built into the Tama marching drums. You can’t tell by the photos that are out. The snare strainer, gut system, throw off, and gut muting system sets a complete new standard for marching snare drums. The tenor adjustability plus multiple new features I can’t mention, are the new state of the art. Many small details have been thought out and incorporated into the way the drums function, tune, and adjust. Stability of drums, carriers and stands has been given high priority. Many safety features are also built into the drums. Chrome hardware is standard and there is an incredible selection of top shelf lacquer finishes. Every detail is first class…..period. Tama is not entering the market hoping that their product will somehow be good enough to compete. Quite the opposite. The other companies will be forced to run back to the drawing board and try to figure out how they just got blown out of the water. This goes for carriers and stands too. Most important is the sound. Spectacular! Combination birch/bubinga shells or maple shells, it’s your choice. Hello. The whole bottom of the drum is the key here. The metal rails that hold the guts provide many functions. They keep the guts at the same tension if you turn the drum to tenor or take the guts off completely to change a head. You can individually tune each gut without having the guts on the drum. You can easily remove or replace the guts in 2-3 seconds with the Tama quick release system. Current drums make you turn a knob forever and slide the guts out making them loose and twisted. Same thing to put them back on. I hate that. The Tama “Buzz Killer Mutes” eliminate the need for any kind of tape. You can position the mutes anywhere you want on the bottom rail and adjust the pressure of felt pads on the guts for your custom sound. You can turn the mutes off if you want and you can also take them off if you want in a couple seconds. If you take the guts off of the drum, the mutes stay exactly in place. Pretty cool. The strainer has no tension on it because all of the tension on the guts is supported by the gut rail system. Because of this, the vertical adjustment of the guts is easy and smooth. There is no jamming or difficulty to turn the knobs like on other drums. I hate that. The strainer throw off is positioned by the top head in easy reach. You can actually turn to tenor if you want. Extra cool. There is a built in feature so players cannot accidentally raise the guts too high on either side causing a bending of the guts. There are locking mechanisms to the carrier and stand so the drums won’t fall off. The snare can lock to the stand upside down for easy tuning of the bottom head. Now that is cool, no bending over. Throw in a combination birch/bubinga shell, chrome hardware standard, and a beautiful lacquer finish……..that’s what I’m talking about. The sound is incredible. Great attack with full warm sound, no extra ringing like on some drums. This is just a little info on the snare. The list of “wow” things about the tenor drums is equally as long. Same with carriers stands etc. I would love to get a set her for our line in Brasil! What kind of price range are we talking here? How durable and how heavy? Will Tama make a Shorty’ version? 14×10 or like the yamaha piccolo snare 14×9? Would love to see some old school 12″x15″ leg drums.I would love to see a red sparkle leg drum. Just like the one the Long Beach Jr Concert band use.www.LBJCB.org. They use 12×15 snare drums, 12×15 tenor drums and 16″x29′ bass drums. I know tama drums are the best.and are very LOUD. I’m surprised I never saw any booth or showcase at DCI finals. These will probably be just like mapex drums and take a few years to catch on to Drum Corps.